If you would come to visit us just for the Lisbon Food, you wouldn't be disappointed. Besides the wonderful Sea Food, the traditional Bacalhau and the Caldeirada that I talked about in the Lisbon restaurants page there are many more options to consider. In this page I'm going to present you some, but much more will remain to say. I challenge you to find new plates and pieces of the gastronomical art of our people while you are here. If you have the chance, go and eat with a local (with some knowledge on the field, of course). He can certainly show you our delicious cusine. If you don't know anyone here, you can always invite me to have lunch or dinner with you. My pleasure! Also, don't forget to see what's on the menu with the precious help of the Food Dictionary. So, what can we eat in Lisbon? We have plenty of fresh fish and seafood. You have to try some. For example, we just love Sardinhas (Portuguese sardine). Especially in the summer. I love to grill them outside, kind like a fish barbecue, while I drink a beer. They go with bread, boiled potatoes and salad (tomato, lettuce, onion and capsicum). Fantastic! Maybe, you won't have the opportunity (or the will) to grill them yourself. So, you can find them in the restaurants ready to eat. 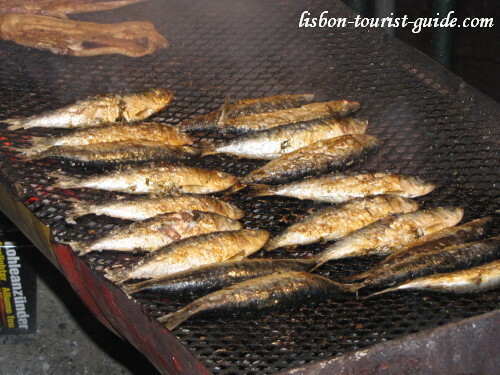 The Sardine is very popular in the Santos Populares festivities (middle May - middle June) all over the city. Another popular dish is the Feijoada - a rich stew of beans, pork and sausage. Everybody here is fan of they're own mother's feijoada. When you're considering eat meat, there's also a wide range of options. You can eat a Bitoque - a grilled or fried beef or pork topped with a fried egg and served with fried potatoes, rice and salad. The Entrecosto (pork ribs) and the Carne de Porco Preto (black pig meat) are absolutely fabulous. Also, in the pork department you can try Costoletas or Febras (especially those of black pig). Look for the tasty Borrego (Lamb) prepared in two ways - grilled Costoletas or the Ensopado. Alternatively you can taste the Cabrito (Kid). Try the amazing Coelho (rabbit) and the superb Arroz de Pato (baked duck and rice with a crunchy top). For a good budget meal you can have the Frango Assado (grilled chicken). We, Portuguese people, always have Bread with our meals. That's because the bread here is simply fantastic. Meanwhile, I think I'm going to eat something... Some Lisbon food, of course!